Prologue: Widow is real sensation of Horror and Heavy Metal from the U.S.A., banging for more than 10 years in the classic sound of Heavy Metal music! With 4 fulllength albums and countless live shows, you can easily say that they're keeping more than just "busy". Chris Bennett, founder and frontman of the band, takes a little time off his busy Christmas schedule to share a few words with us. Hello Chris and welcome, thanks for finding time for the interview. Thanks for having me Elias!!! Would you care to share with us a short bio of the band? 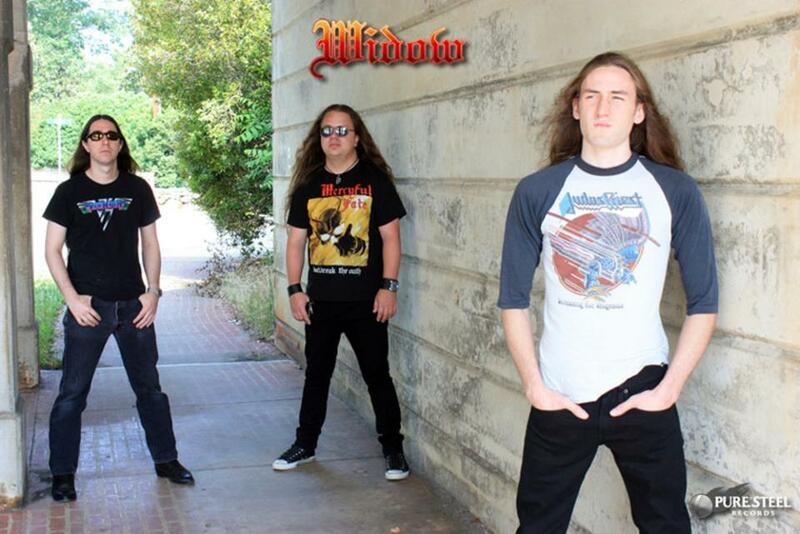 Widow was formed in 2000 here in North Carolina. 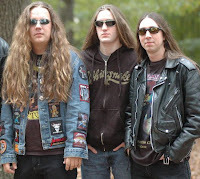 We really were formed first of all because we loved traditional metal, and to have fun playing locally around NC. I would never have believed that we would have released four albums and played in different countries around the world. I'm so grateful to have had that opportunity. We've really devoted our lives to heavy metal, and it means a lot that people appreciate what we do!!! You’ve had a lot of lineup changes over these years. How did that affect the band? Yes, the band really started around me, John E Wooten, and Joshua Pantke. Johnny was on guitar then. We had numerous drummers, and a couple of bass players after Josh left the band in 2009. We even had a female singer on the album On Fire, which was cool, but we just had a lot of differences with her. But, Johnny switched to bass, and honestly the line up of me, Johnny and Peter Lemiuex on drums is the best we've ever had. We sound the best as a three piece, and we are devoted to playing as much as we can. Peter has been here for six years, and we get along great and just have a blast together!!! Despite the fact that you guys are touring all the time, you also have released four great albums in the last nine years. You’re definitely overactive with the band right? Oh, thanks man!!! I never turn it off, that's for sure! I'm living this 24/7! The last few years have been the busiest for us. We got mentioned in magazines all over the place that we are a big part of the New Wave of Traditional Metal. I'm so happy that new fans are getting exposed to this type of music, it's really cool. But, we've been playing this style for a long time, and we would do it whether it's popular or not! I love this music, and to the real fans of metal, this is a lifestyle! But, when all this New Wave stuff came about, we got a lot of touring opportunities, and that rules! We've played around the US, Canada, Germany, and Japan this year!!! It's really awesome! As far as the albums go, we have worked so hard on all four of them. I really think we worked the hardest on Life's Blood though, our newest one. It took a few years to get that one done. But I think it's our best, and so far people around the world seem to agree!!!! What do you enjoy most about touring and playing live? My favorite thing about touring is meeting people who are big fans of metal, just like me. People that truly live for this stuff! I love to be a part of their scene and life for just one day! It's really cool! It was so shocking to me, going to Europe and Japan and seeing SO many metalheads, it's paradise there!!!! Canada really is like that too. The US scene is really getting better and better too! 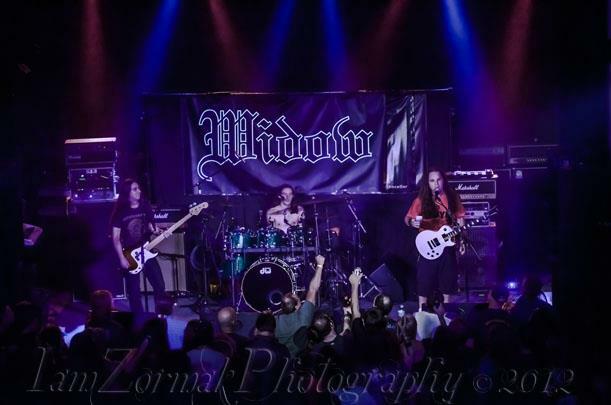 On our last US tour with White Wizzard and Icarus Witch, it was amazing to see so many people supporting this music. You probably couldn't have done a tour like that a few years ago! It was so much fun!!!! 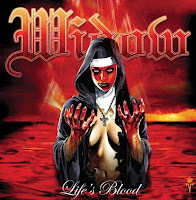 “Life’s Blood” is your latest album and I can easily say that it’s among my top-5 Heavy Metal albums of 2011. Tell us a few things about the album and the response that it got. Thank you so much!!! It really got the best response of any Widow album so far. What really happened with the album, is that I wanted to get rid of the excess, just have a stripped down, straight forward album from start to finish. Just focus on the songs, not so much guitar or whatever. I really think it worked, and our best songs were created from that. I love all our albums, and at the time that was the best we could do. But I felt we needed to make something way beyond what we had done before. 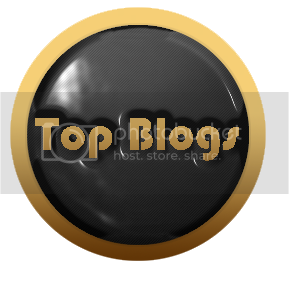 Several different magazines listed in it their best of 2011 lists! I really appreciate this, it means a lot to see that after working so hard on the record! I really love the artwork in “Life’s Blood”. It is way different from the artwork on your previous albums. What inspired it? We wanted to have some sort of character sum up the entire album, and we came up with "Lady Twilight", which is the first song on the album. We got this German artist, Timo Wuerz, to do the artwork. This guy is absolutely incredible! I thought his rough sketch was good enough to be the cover hahaha! I love his work, and he really brought her to life. I felt we had the best songs we had ever had, and I knew we needed our best cover to go with it! Thanks to Timo, I think we got it!!! I like all your albums and strangely, I’ve heard them backwards. First I heard “Nightlife”, then “On Fire” and last “Midnight Strikes”. I had always wondered why I hadn’t heard of you before. Was the press kind on you all those years? Well, in the US maybe not so much at first with Midnight Strikes. It was so different at the time, and I think people thought the sound was "dated". But on the other hand, their were also people who to this day think Midnight Strikes is our best album! But, on all the albums we've always gotten mostly positive press, and the fans have really always supported us since the beginning. It amazes me, and makes me so happy! 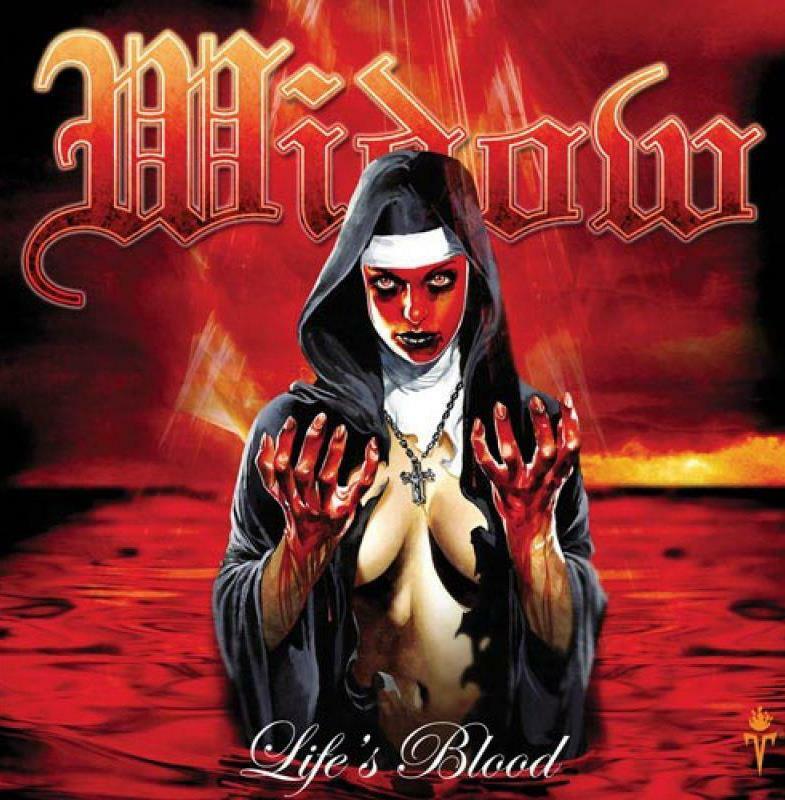 With Life's Blood, it was pretty much unanimous around the globe that the album was great! That was hard for me to believe, I was expecting some people to bash it hahahaha! More and more bands with the “classic” sound are getting a warm welcome here in Europe nowadays. I’m not sure that I can say the same about the U.S.A. though. How do you see the Heavy Metal scene now? Well, the US is tricky. It is hard to break through here with people. You just really have to tour here constantly to make a name for yourself. But just like in Europe, there are die hard metallers here too! Over the last few years we've been out on the road, I've noticed lots of younger kids getting into true heavy metal. It really does my heart good to see them getting into bands like Angel Witch, Warlord, and Diamond Head! Man, we just played with Raven, and the show was packed! It was so awesome!!! This music makes fans for life, so I know that no matter what, it will last! And we will stick around too! Nowadays more and more bands, old and new, are rushing to become part of the Internet and Social Media. Do you believe that this is a good or harmful thing? I'm a little older, so I used to be part of the tape trading underground. I would write and receive letter from people everywhere! It was hard work, but it was so rewarding! It seems that the internet has allowed everyone the ability to do this same thing, only much easier and faster! So I don't think it's a bad thing. I think it exposes a lot of people to bands they might not have heard of, and that rules!!!! But . . . it also floods the scene with tons and tons of bands that maybe haven't developed yet. We worked really hard in the beginning of Widow to develop our sound. So when we did finally release an album, we were ready to rock haha!!!!! Your albums are a little hard to find and if I’m not mistaken, you’ve rereleased your first album “Midnight Strikes” with a slightly different title right? Yes, it's called Midnight Strikes Twice! It's got our demo on it also! And, it has a live concert you can watch on your computer from 2004 with Josh on bass and the drummer from Midnight Strikes Tim Heisman. The album was out of print, and their was a real demand for it to be reissued! That is awesome, and I'm glad that people who missed it got a chance to hear the album. Like I said earlier, their are people that say it's our best album! I think it's great, but On Fire and Nightlife are all cool for different reasons. Just like Life's Blood, each one shows where our heads were at during that time. And I can assure you, we will always play songs from each album live. I know people like different albums, and I know how awesome it is when you go to a show and get a song from that album that you love!!!! Tell us a few things about your influences as a band and as a musician. What inspires you mostly to create? My biggest influences are bands like King Diamond, Metallica, Van Halen, Ozzy, Priest, Maiden. Also, bands like Crimson Glory, Queensryche, Leatherwolf, and Warlord! Also bands that we don't sound exactly like, but still inspired me are Slayer, Venom, the Ramones, the Misfits, Skynyrd, KISS, Thin Lizzy and Def Leppard. I love so much stuff man, I've been inspired greatly by Dokken, Ratt and hair metal bands too! I love everything from Thrash, Death and Black Metal to Motley Crue! I also love 80's pop music, like Michael Jackson, Prince, and Pat Benatar! I think having a wide range of influences is the best way to have a unique sound. Most bands that deal with horror themes in their lyrics are either packed with a ton of keyboards and female vocals or have a certain dress code or both. How d you manage to combine horror with classic Heavy Metal? I am such of fan of the classic horror movies, like the Exorcist, Phantasm, the Omen, etc. I wanted to get that feeling into a traditional metal band! We play almost always in minor keys, and I really felt the two went together well! And you're right, a lot of bands have the dress code or whatever! I don't want to follow any rules man! Widow is just ourselves! I can't be any other way!!!!!! Most of the new bands I love I'm lucky to call them friends! We've toured with Cauldron, and their new album is great! 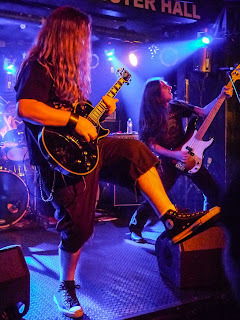 We were in Japan with Skull Fist, and they blew me away live! They are killer too! And I had not really heard White Wizzard when we went out with them, and I went out and bought both of their albums and loved them! They are awesome too! I'm also way into Municipal Waste, Icarus Witch, Ghost, Twisted Tower Dire, Hellfueled, Midnight, Slough Feg and High Spirits! 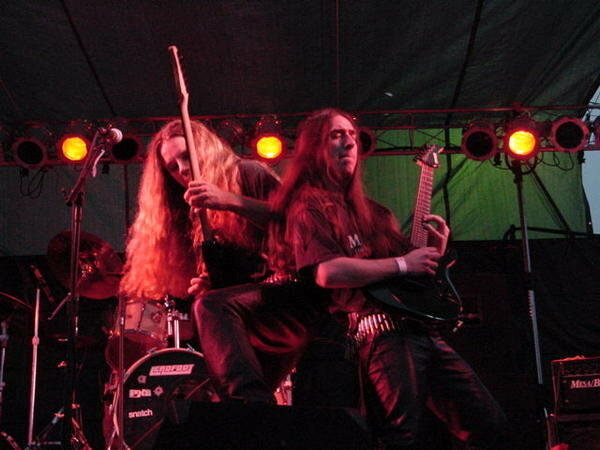 I recently discovered a Swedish death metal band called Vampire that I really dig! Some of these bands aren't that new haha, but I love them anyway!!!! What does the future hold for Widow? Any plans? We've got some touring that is lining up for 2013, and I'm really excited about that! 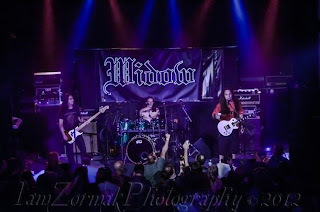 Keep in touch with us on facebook at www.facebook.com/widowtheband or at www.widowusa.com and we'll make some announcements really soon!!! Also, we've demoed songs for a new album that we will record this year! I'm really excited about it!!!! Hopefully we will record it by summer and it will be out not too long after that! 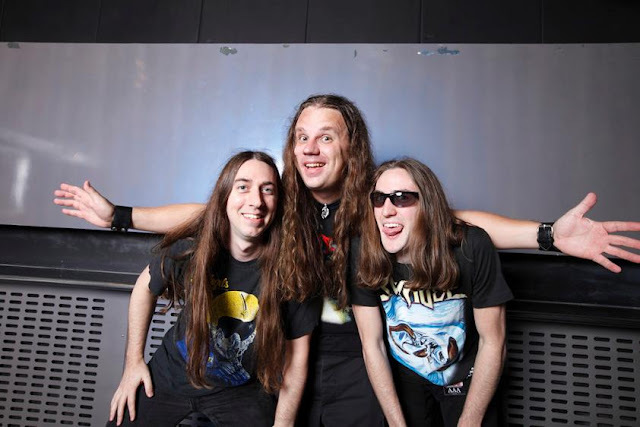 You have a show planned in Greece on the 9th of March 2013 at the “Up The Hammers Festival”. How does it feel to play in Greece for the first time? What should we expect from Widow? I am beyond excited to get to Greece! It's somewhere I have always wanted to go, the country is so beautiful! And I've heard it's one of the best places in the world for real traditional metal! Manolis, who puts on the fest, is such a cool dude and I really appreciate him giving us the chance to play there! I've got a lot of friends over there, and I just can't wait to get there and party with everyone!!!! It will rule I can tell you that!!!!!!!!!!! Let us finish this interview by sending a message from Widow to the Greek fans. 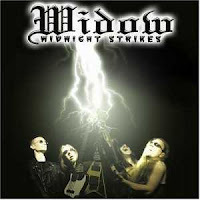 I want to say thank you for supporting Widow, and I cannot wait to meet you guys in March at Up the Hammers!!! It's gonna be a party we'll never forget!!! Cheers everyone, see you at the bar . . .